Goal for today: reuse attributes of the Acumatica fields. I am sure most of you when tried to add a new field to Acumatica, was thinking about reusing the selector from an existing fields. For example, in a screen for RQ Request I would like to add Project ID field. I know that this field is used in GL Journal Transaction details also in AR Invoice header screen and many other places. Well, it was a problem till version 4.2. Before the browser did not display special source code. But now, in Acumatica 4.2 onward, I can find what is behind this sacred code and reuse it the way I want. Let me show the place where you can search for the code. 1. I do not need to default anything. 2. 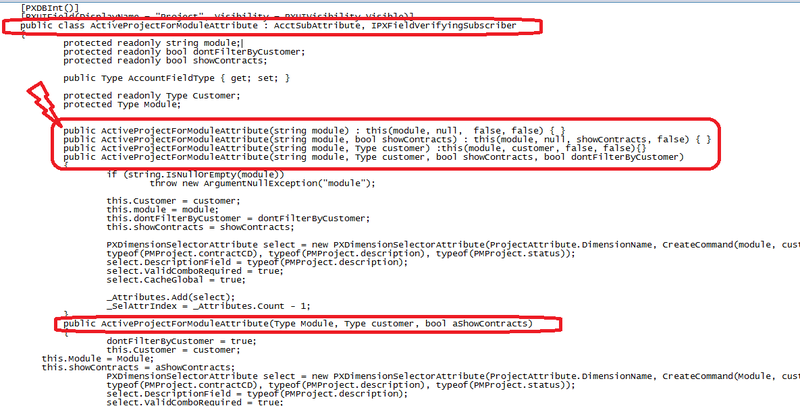 [PM.ActiveProjectForModule(PX.Objects.GL.BatchModule.AR)] will be the attribute. Why PX.Objects.GL. need to be added in forn - is due to Attributes are not in the main graph form and need to be declared directly. So we have a single parameter left from the original AR Screen attribute.